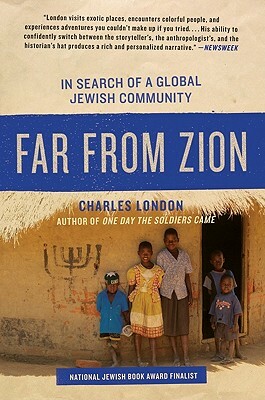 A fascinating narrative of community and faith, Charles London’s Far From Zion explores the Jewish Diaspora in some of the most unexpected places—from Burma to Tehran to Cuba and even Bentonville, Arkansas. The award-winning author of the highly acclaimed One Day the Soldiers Came, London tells the stories of the Jews who stayed behind, choosing to remain in the countries of their birth rather than immigrating to the Holy Land of Israel. At once a riveting modern history of a scattered People of the Book and London’s moving story of his own personal odyssey of religious and cultural discovery, Far From Zion is an affecting and unforgettable study of diversity, tenacity, survival, and rebirth. Charles London is a former research associate with Refugees International and director of curriculum for War Kids Relief, a peace-building organization. He is the 1999 winner of the Rolling Stone College Journalism Award, and his work has appeared in the New York Times Magazine, O, The Oprah Magazine, and other national publications. He has been a young-adult librarian for the New York Public Library and is the author of One Day the Soldiers Came: Voices of Children in War. He lives in New York City.